When a baby is born in Hindu family the very first thing they do is prepare a Kundali of that child. From this kundali the future of that guy is predicted. It is also used to match with the kundali of the other person before a couple decides to marry. So what is the main significance of this kundali in our life? and in what ways does it affects us? Kundali is the Hindi for what we call 'Horoscope' in English. It is a pretty widely used thing in astrology. It is based on the fact that heavenly bodies and their positions at the time of an event effects how the event goes on. So in the case of the birth of a child, we record when he/she is born, at what place and other details. Astrologers, then on the basis of position of prominent stars, 7 planets, Sun and the Moon about that time create a chart, similar to the pic you posted (number of charts is not limited to 1). Not only on the birth of someone, but astrologers also use the Horoscope calculation in numerous other events. When sacred rituals take place, we try to do them in specific time spans called Shubh Mahurats which are considered good. These time spans are predicted the same way Horoscopes are calculated, but in some different context. Shubh Mahuratas are calculated/predicted for most things like marriages, ring-ceremony, baby-showers etc. There are total 12 houses1 in all. Each house can accommodate a heavenly body. Each house also corresponds to specific areas of life. The first house, for example signifies life, longevity, self, health, nature and appearance of native; Complexion, vitality, sorrows, gains and profits to younger brothers and his friends. It governs head and face. The heavenly body present in the house signifies how the person's life will go on in that area. These heavenly bodies keep changing their positions with time; thus, your daily horoscope changes. The change depends on which graha comes in. Further detailed horoscope information for a particular person can be calculated for specific transits by astrologers, when given birth details. This is done by seeing the most initial graha which was present in the house. Then, we calculate which graha will be more strong. If a strong (and good) graha comes in, life in that area will be good and vice versa. 1. Reference - Astrology Basics See this link for more details on houses. Though, Kundali/Janampatri (or 'Horoscope' in English) may be prepared anytime by providing - date, month and year of birth along with time and place (longitude and latitude) Kundli is divided on 12 houses of 30 degrees each (total 360 degrees complete circle) and further divided into 27 Nakshtras. Each Nakshtras are further divided into four charans or padas. 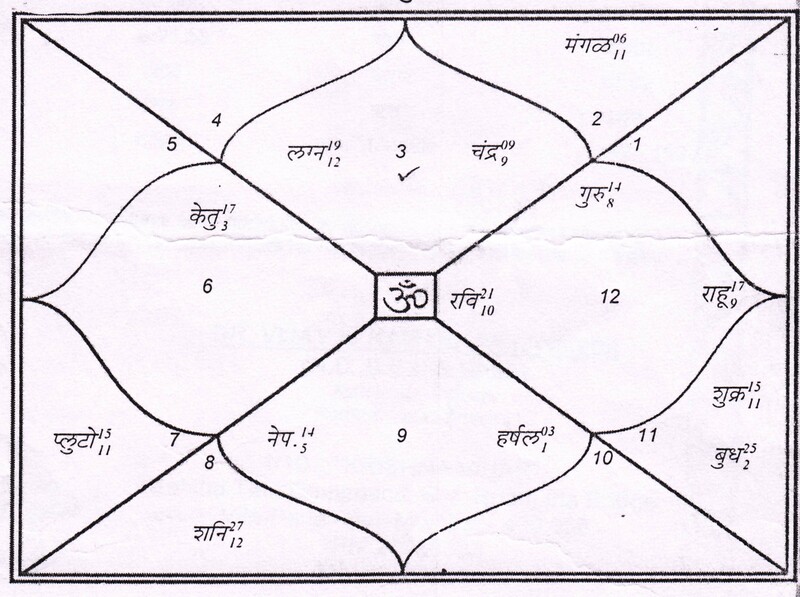 Planets according to their physical alignment at the time of birth as seen from place of birth are recorded in the kundli. There are nine planets : Sun, Moon, Mars, Mercury, Venus, Jupiter, Saturn , Rahu and Ketu. (Rahu and Ketu though nodes of earth but are treated as planets for all astrological purpose). Kundli is the map of your journey of life. The position of the ascendant, signs, house(s) and planets in the Kundli determines the incidents of your life. The incidents of your life are determined by the Kundli which can not be changed but their auspiciousness can be maintained if you perform good deeds and help others. Kundli is prepared at the time birth to ascertain the alphabet according to the charan of the nakshatra. That alphabet maybe used to keep the name of the child. Also, Kundli is seen for any immediate such as health (even death) of child. In case, of any negative planetary influence, appropriate remedies such as pooja , havan , daan etc are performed/done. Through a Kundli, one can ascertain any details about the jatak's (the person whose chart is being checked) life. It is possible to check for health, work and what kind of work, general life, wealth, friends, enemies, spouse(s), legal matters and many more things. Matchmaking is also done through this, the usual matching practice is matching of Gunas and checking for Manglik Dosha which are both incomplete as they check primarily 1 planet out of 9. A good astrologer will check the Kundli for all 9 planets. The happiness and sorrowfulness in your life comes according to the work you performed in previous birth. Therefore if you perform good deeds, spiritual and charitable activities then you will face minor problems or obstacles in your life. The Kundli and Muhurta are interrelated because if you perform auspicious tasks and events in an auspicious Muhurta according to your birth-chart, you will be happy and your problems may also get reduced. Therefore, the need of the hour is to give primacy to Muhurta for performing any auspicious event. Q. Dear Gurudev, astrologically I am under the influence of Rahu-Shani planetary combination. This has made me frustrated, angry, and irritable most of the time. I am going away from the spiritual path and creating trouble for others around me. Please help. A: At least you have this knowledge. If you have understood this much, then you know that all these negative emotions are just a passing phase. You know this is because of some planetary combination. This is where astrology comes to your help in a big way. Suppose you didn’t know that it is because of these planetary combinations, what would happen to you? You would brand the whole world as negative. You will think you are negative and you will feel dejected forever, isn’t it so? That is why Jyotish (astrology) is called the Eye of Wisdom. It makes you see beyond your immediate situation, and know that it is only for a short time, and it is going to change. You gain some unknown inner strength from this. And you will not start blaming yourself or people around you. It is always better to blame the planets because they are so far away. You can’t do anything about them. They move at their own pace, you can’t hasten their movement. Whenever things go wrong, the natural tendency is to blame yourself or blame others. In either case you are at a loss. But when you put the blame on the planets you are free from blaming others and blaming yourself. So a certain degree of sanity comes into your life. This is one advantage of it. You should know there is always a remedy for this. What is it? Adoring the Divine. On top of all the planets is Lord Shiva or the Shiva Tattva. So by chanting Om Namah Shivaya, you will sail through all this. I tell you, in any of these unfavourable situations there is always an advantage, i.e., turning more inward and becoming more spiritual. In favourable situations your mind is outward, so at least in unfavourable situations you can turn your mind inward and utilize this time for prayer and meditation. All of these, Rahu Bhukti, Shani Bhukti, Ketu Bhukti, etc., are all very good for spiritual growth. The main purpose of Shani (one of the nine cosmic influencers in Hindu astrology) is to make you more spiritual. And how does he do it? When you are clinging on to the outer, he brings problem there to bring you inward. If you are already inward, he does not have anything much to do. His job is done so there will not be any problem also. Even if problems are there they would be minimum, they will just come and go. So every situation can be used for one’s benefit. First we have to know one thing that , whole universe is one organic unity so whatever happening in universe indirectly or directly effect us and other things in a way. It could be good or bad , But it can be changed through the channeling of energy by different ways.Its a science which assist to be in harmony with universe. Not the answer you're looking for? Browse other questions tagged astrology horoscopes . What is the panchang to be used when generating a horoscope? What is Rashi in Jyotisha or Hindu astrology? Is Pitra Dosh in Kundali specific or densty specific? What horoscope matching factors are necessary for a marriage? Can an astrologer himself cast the Prasna Kundali for one of his own questions? How is bodily complexion determined from the horoscope of the native?